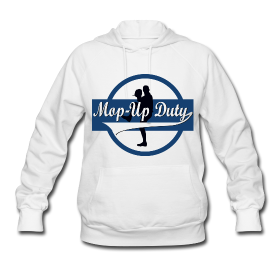 If you’ve been a regular reader of Mop-Up Duty in the past, you know of our affinity toward former Blue Jays pitcher Roy Halladay. During a bleak period of perpetual mediocrity for the Toronto franchise, Roy Halladay made me proud to be a Blue Jays fan. I made a point to see every Halladay start because he always gave his team a chance to win. Roy’s wife, Brandy, was a force of nature for the Lady Jays, raising money every season for the Jays Care Foundation to remove barriers to sport and recreation for children and youth living below the poverty line. Roy and Brandy were Toronto’s power couple for 10 years. 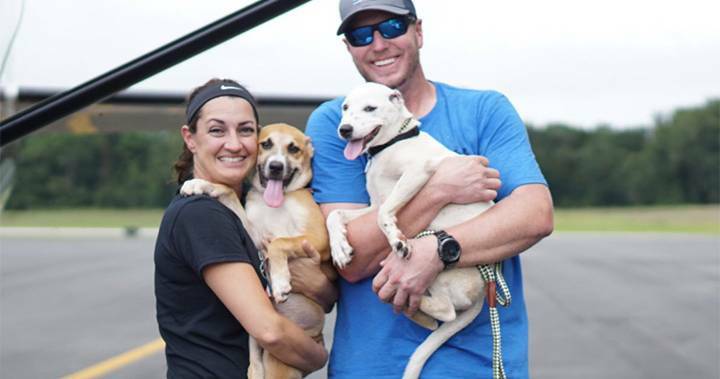 They even rescued dogs! What more could you want? 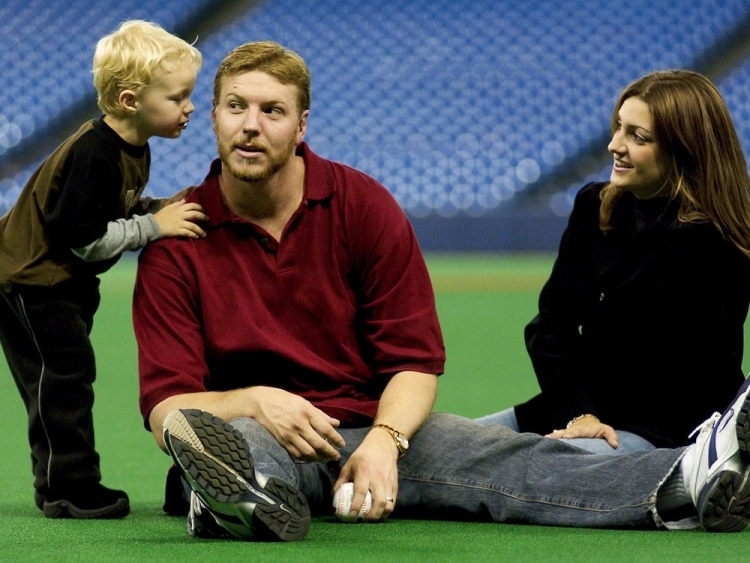 In 2001, the Halladays welcomed their first son. Born in Toronto, Braden could often be seen at the SkyDome or in the clubhouse with his Dad. As he grew older, Blue Jays fans would see Braden and his younger brother Ryan at charity events and All-Star game parades. The last time Blue Jays fans saw the two Halladay boys was in 2013 when their Dad signed a one-day contract to end his career as a member of the Toronto Blue Jays, and then when Doc was inducted into the Canadian Baseball Hall of Fame. Following Roy Halladay’s tragic death, Sportsnet’s Gare Joyce wrote an excellent, in-depth piece on Doc’s involvement as a coach with his son’s varsity baseball team, the Calvary Christian Warriors. Roy had an incredible impact not only on his son Braden, but the entire Calvary baseball team. “Roy believed in me more than I believed in myself. 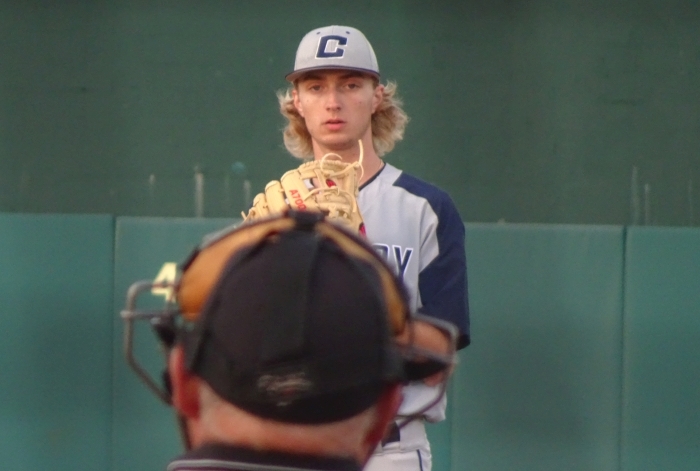 It was Roy who really convinced me to pitch my senior year.” – Jonathan Fisher, pitcher, Calvary Christian High School. It’s worth carving some time out of your day to read the piece in its entirety. It has stayed with me. Last season, Team Canada general manager Greg Hamilton invited 17-year old Braden Halladay to join Canada’s junior national baseball team for an exhibition game vs. the Toronto Blue Jays. As a dual Canadian-American citizen, Braden is eligible to play for Canada’s national team. He accepted. Blue Jays fans who watched the younger Halladay’s appearance vs. the Blue Jays noticed many similarities to his Dad. His build, the windup, were something Blue Jay fans had been used to seeing every fifth day at the Dome. 58 seconds of Braden Halladay carving ? The video in the tweet showed Braden dismantling an over-matched high school team from Atlanta, the Lovett Lions. It occurred to me that I might be able to have the opportunity to see Braden pitch live. I had booked a trip to Dunedin, Florida to catch a few Blue Jays spring training games. Braden’s Calvary Christian High School plays out of Clearwater, Florida, only a 10 minute drive south of Dunedin. If the timing worked, I might be able to see him play. Luckily for me, it did. I use the term “scouting” as loosely as possible. I’m no scout, but I do know baseball and can provide some observations that may have value. I’m also going to refrain from making comparisons to his father, since it’s not really fair: Braden is his own man. On March 21, 2019 I attended a game between Halladay’s Calvary Christian Warriors, and the home team Clearwater Tornadoes. The game was played at beautiful Jack Russell Stadium in Clearwater. Formerly the spring training home of the Philadelphia Phillies, Jack Russell is now the home ballpark for the Clearwater high school baseball team and the Dunedin Blue Jays while Dunedin Stadium undergoes extensive renovations. It’s a small park, but quite nice. Braden Halladay looks to have grown a few inches over the past year, but doesn’t seem to have put on much weight. I’m guessing he’s now 6’4” or 6’5” and weighs in at around 160-165lbs. He has quite a few pitches in his repertoire. From my vantage point, he throws a four seam fastball, a sinker, a changeup, a traditional 12-6 curveball, and a cut fastball. On this night he struggled to command most of them – more on that later. Here Halladay shows his 12-6 curveball and changeup. Apologies for the vertical video – I was doing it for the ‘gram. Here’s his cut fastball with significant late life, followed by a straight fastball. Here is footage I took of Halladay warming up between innings. He mixes in most of his pitches here. He starts with a four-seam fastball, then the curveball – but it looks more like a slurve than the 12-6 he used in the game. Another fastball, then it’s a changeup with fade – or a sinker. It’s hard to tell. He then finishes the set with a fastball. He looked pretty sharp here, but he does have a tendency to sling the fastball at times – which is understandable considering he has long limbs. He had the same kind of stuff here as he did in the Lovett game. But when it was game time, he wasn’t the same. The Clearwater Tornadoes are clearly outclassed by Calvary. However, Clearwater managed to score two runs in the first inning through no fault of their own. Halladay struggled to command his pitches and walked the bases loaded. I can speculate as to why, but I want to make it clear I have no idea. You can hear the Clearwater dugout riding him hard in the two videos above, and it’s important to remember that Halladay is still only an 18 year old kid. Did he let it affect him? I doubt it. My guess is that he was struggling with his mechanics – he’s still growing into his body. On this occasion, Clearwater didn’t beat him – Halladay beat himself. To be honest, nobody really got beat except Clearwater – they were mercied in the 5th inning, losing by a score of 12-2. One of the problems a pitcher faces when playing for an elite team like Calvary is the amount of time spent on the bench while the offense runs up the score. Calvary scored three in the 1st, one in he 2nd, and five in the 3rd, taking about 30 minutess each time to do so. As a pitcher, that much time on the bench between innings cools you down and gets you out of your rhythm. In addition, it got cold REAL quick as soon as the sun went down at Jack Russell Stadium. Braden would motion his delivery from time to time – as you can see at the beginning of this video – which made me believe he was having difficulty getting comfortable. Here he throws a changeup for a swinging strike – a nice pitch for him. Here we have another strikeout. You can see the Calvary catcher sets up almost in the left-handed hitter’s batter’s box, and Halladay hits the target. It’s clearly not a strike, but Halladay gets the call. These are the types of calls you get when you’re the son of a Hall-of-Famer. In Braden’s defense, however, he was doing his best to establish the outside corner throughout the game, and sometimes that pays off. Finally, my favourite thing that scouts look at when scouting players: body language. Here Braden allows a walk on a pitch that is very clearly a ball low, and he shows his frustration. Most scouts would say that if you are going to get pitches thrown in the opposite batter’s box called strikes, then you better not be complaining. Scouts will ding prospects for having poor body language. But I don’t care, I think it’s silly. Ballplayers are competitive and show displeasure when calls don’t go their way. It’s normal. 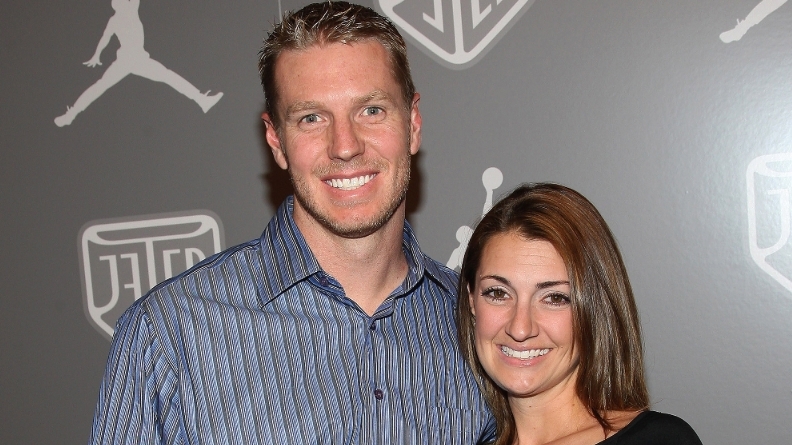 It would be difficult for me to say anything bad about the Halladay family, and I’m not going to start now. While I was super-fortunate to be able to see a Halladay start in person, I think this was an instance of catching Braden on an off night. There were three scouts in attendance, two with a JUGS gun. One had Braden’s fastball topping out at 85mph, which is normal for him. Halladay has committed to pitching for Penn State next season, so it’s not likely that the presence of scouts impacted his performance in any way. Of course, the big question is, how good will Braden be? What will he look like if he fills out and packs 60lbs. onto his frame? How does he project? Does he have a shot at being a Major League baseball player? I have no idea. But it was a pleasure to watch the son of Roy Halladay pitch, and I was reminded again what it was like to feel proud to be a Blue Jays fan. I wish him all the best at Penn State and will continue to follow his baseball career.